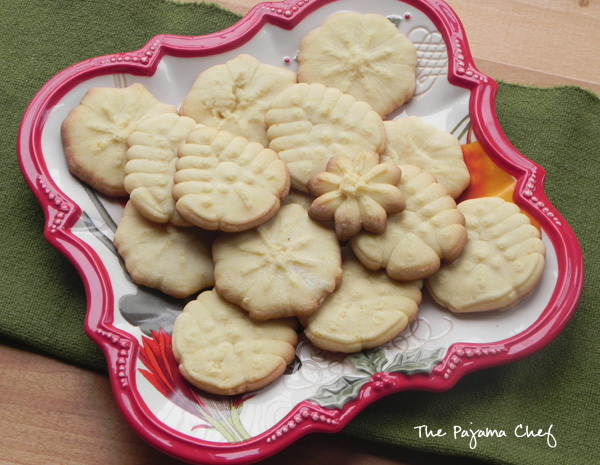 Cute little crisp, buttery Spritz cookies are the perfect addition to your cookie plate this Christmas season! This version has an orange twist for a bit of freshness! It’s always more fun to make cookies at Christmastime, don’t you think? This year for the Secret Recipe Club we are celebrating all things COOKIES by having a fun little cookie carnival. 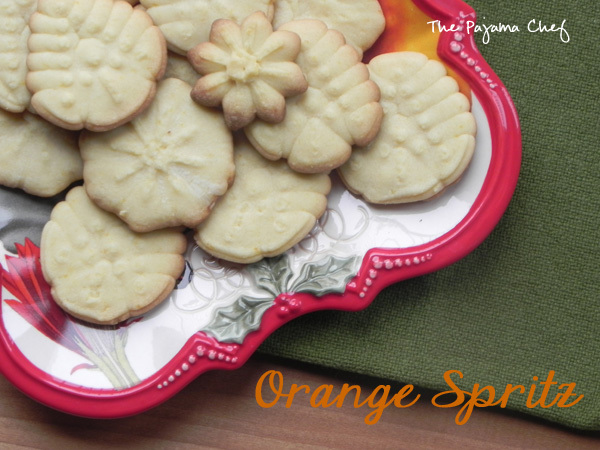 Marsha’s girls love these Orange Spritz cookies–both the eating, and the making. I remember eating Spritz cookies every Christmas growing up… and truthfully, they weren’t my favorite cookies. But as an adult I have given them another chance. They’re so delicate and light, the perfect accompaniment to tea or coffee or even a richer cookie treat. I almost made Marsha’s Lime and Pepper Cookies because they sounded so interesting, so you might want to check that recipe out too! But back to these cookies. This was my first time making Spritz cookies on my own and it was kinda fun, once I got the hang of my cookie press. By “me getting the hang of it” I clearly mean me desperately calling for Ben to come help because I could NOT figure out the instructions. It didn’t help that I have an Italian cookie press and the [oddly] translated instructions are spread out over several pages. Cookie press problems aside, the results were awesome. Thanks, Marsha for the great recipe! Merry Christmas! Preheat oven to 350 degrees F. Line baking sheets with parchment or a silpat. With a mixer, cream together butter and sugar in a large bowl. Beat in salt and the egg yolk until just combined. Add vanilla and orange zest, then beat again. Stir in flour. Fill your cookie press and press out according to the cookie press’ instructions, placing on baking sheets approximately 1 inch apart. Bake for about 8-12 minutes, until edges are golden brown. The original recipe said baking time might be about 6 minutes, but mine was definitely about 12. Cool on baking sheets for a few minutes, then transfer to a cooling rack to cool completely. Next post50 Christmas Cookie Plate Ideas: Cookies, Candy, and More! I love the bit of citrus in these! Such a great cookie. How pretty. I love spritz, I have just been plain too lazy to make them the past few years. They sure look lovely on a cookie tray though. 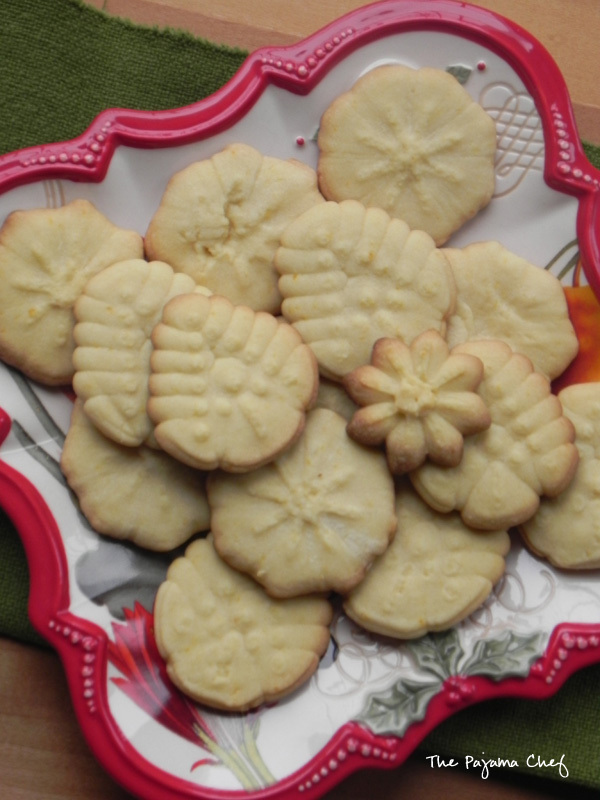 I love making Spritz Cookies…adding orange zest is a great idea. Wow.. Sarah – I just love your blog!!! Thank you so much for the kind words! 🙂 I love these cookies and I am so glad you like them do. As you said, they are really delicate and light are perfect with some tea! And they wouldn’t be amiss on the Christmas table either! Thanks for cooking from my blog 🙂 Merry Christmas!!! Ooh, those lime and pepper ones do sound interesting. These sound delicious with the orange! My mom never made spritz cookies, but my aunts certainly did! I think they’d be delicious with some orange flavor! I agree – making cookies at christmas seems just so much more fun than normally making cookies (even though I love that too!). These sound wonderful – especially with that orange zest! Yum! I haven’t made spritz cookies in years. Love the addition of orange. Perfect for the holidays. So tiny and cute – I bet I could pop a few in my mouth at a time! 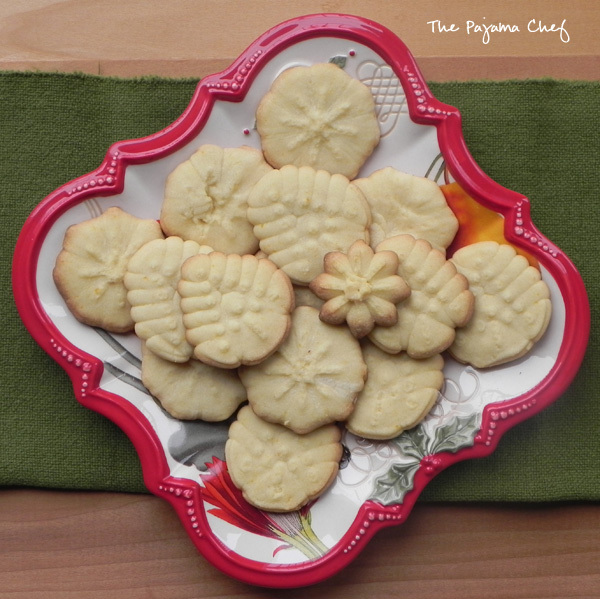 I love a touch of citrus flavor at the holidays and these cookies look perfect! I like the addition of orange – it’s such an unexpected flavor this time of year, and the citrus would be very welcome on a dessert table. Merry Christmas!